Staples filed documents telling Essendant investors they should vote against a competing merger proposal. Staples Inc. made a major move on Tuesday to pull off its biggest acquisition since its play for Office Depot fell apart due to antitrust concerns two years ago. One interesting twist: The giant office supplier in Framingham is now citing federal antitrust concerns as the top reason its offer for Essendant, an Illinois office supplies wholesaler, should go through. Here’s why. Staples filed documents with the Securities and Exchange Commission on Tuesday, telling Essendant shareholders that they should vote against a competing merger proposal, one that would combine Essendant with Genuine Parts Co.’s S.P. Richards business. Because those two companies are wholesalers that sell office supplies to resellers, Staples argues that the merger essentially would create a monopoly — and antitrust regulators at the Federal Trade Commission don’t like monopolies. (Staples primarily sells directly to companies and to consumers.) With an Oct. 5 vote scheduled, Essendant’s board could have a proxy battle on its hands. 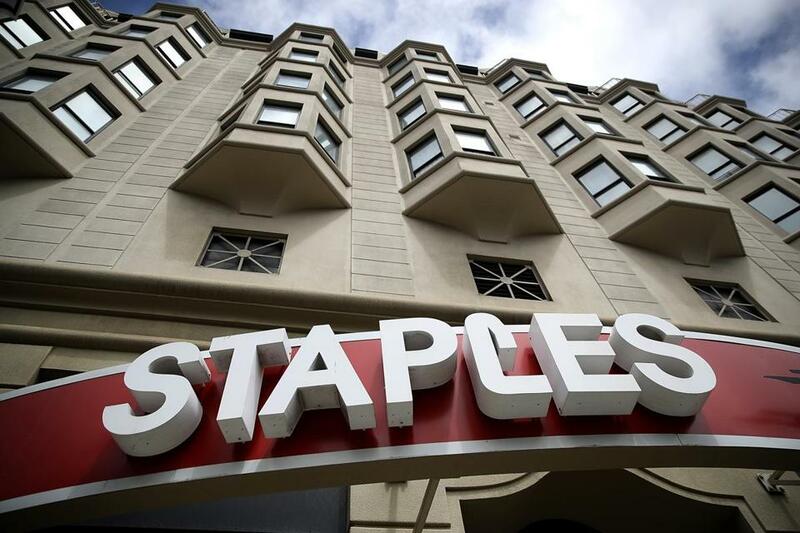 A spokesman for Essendant declined to comment about Staples’ latest maneuvers. But Essendant chief executive Ric Phillips told analysts in April that he was confident his team could win the necessary regulatory approvals and close the deal by year’s end. Staples already controls 11 percent of Essendant’s shares, and has offered $11.50 a share to buy the rest — a price that values the proposal at an estimated $434 million. It’s not easy to compare the Staples offer, dollar-for-dollar, with the S.P. Richards deal. But Staples gives it a try in a way, pointing out that Essendant shares traded below $10 a share after Essendant unveiled the S.P. Richards merger plan in April. The stock only went above that threshold after it became public that Staples, with help from private equity parent Sycamore Partners, had begun showing an interest and buying up Essendant stock. The stock now trades above $14, presumably because investors expect a stronger offer from Staples to be forthcoming. Can you blame them? Staples has hinted, in its talks with Essendant, that it could go significantly higher. But for now, Staples is sticking with its $11.50 offer — and its strategy of showing Essendant investors what could go wrong with the rival proposal that’s on the table.